Posted by dutchgrub	on Monday, July 13, 2009 at 16:51. 0 Comments. Yesterday we scored big time at Le Fournil de Sebastien on our regular Saturday food shopping trip. Le Fournil is a French artisan bakery on Olympiaplein in Amsterdam Zuid. It’s a small shop with adjacent bakery behind a large window. 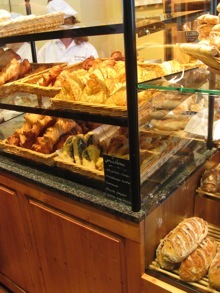 There is an incredible smell of fresh bread and pastry that always makes me want to buy the entire range of products. We went to Fournil to buy bread to have with a Portuguese sheep cheese and found La Faluche to be just perfect, a white sourdough bread with a thick but not too hard crust. Predictably, that was only the beginning. And inspired by the amazing smell, we also got three michettes, a pain au chocolat, a pain aux raisins and a bag of freshly made madeleines. 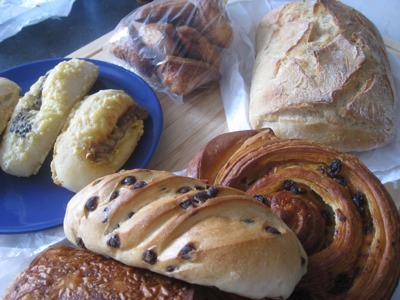 Le Fournil has a large selection of typical French bread and pastry – sweet and savoury, traditional and unusual. There are croissants and baguettes, little tartelettes with strawberries and crème brûlée, brioches, and all sorts of bread – white, dark, whole grain, with figs and much more. Service is efficient with five or six people making the often long lines of customers move along quickly. The personnel is friendly, clad in white baker uniforms and mostly French. Opening hours are long – Monday through Saturday from 7:00 to 19:00 – almost unheard of for Amsterdam. And prices are reasonable, around € 1,= for croissant or pain au chocolat. It’s great to have Le Fournil in Amsterdam. The quality and selection are much better than those of the standard Dutch bakeries. 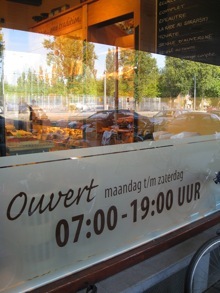 And opening hours are much longer and prices much lower at Le Fournil than at high-end bakeries like Simon Meijssen, Bakken met Passie or De Bakkerswinkel. Filed under amsterdam, food, shop.